Earlier this month, the group responsible for introducing a universal set of emojis proposed 157 new emojis that are expected to be available later this year. The addition of the new emojis would take the total tally to 2,823. The proposal included emojis for curly-haired people, redheads and even bald people. There will also be superhero and supervillain emojis, of all genders and colours. Some additions have also been made to the food and animal section - soon you can include a mango, lettuce, cupcake, kangaroo, rhino and raccoon in your messages. Although most headlines about the new emoji list were dominated by redheads rejoicing about finally getting representation in the emojisphere, on the sidelines another emoji was being quietly celebrated. It was the lobster. The introduction of the lobster emoji had many cheering. The biggest came from the residents of Maine, a US coastal state known for its lobsters. They were so ecstatic that even their senator tweeted about the good news. But celebrations quickly turned to anger as people realised the proposed lobster image had only 8 legs as opposed to the 10 that it actually has. On social media, Maine residents voiced their protest against the anatomical error in the emoji dedicated to their beloved lobster. Not just the two missing legs, local media also said that the design seemed to have extra crusher claw and a "grossly malformed" tail. 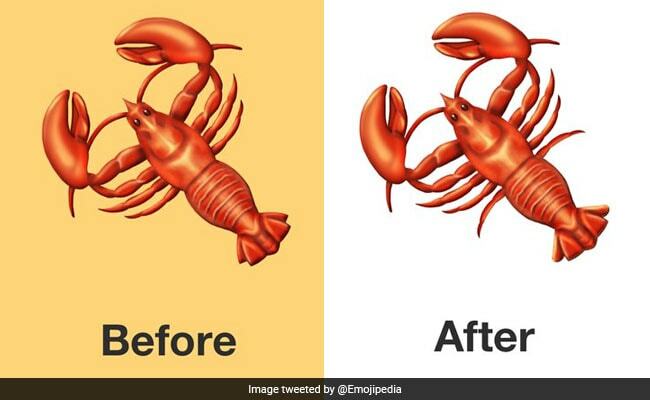 So, following the outcry, the Unicode Consortium finally decided to give the crustacean the two extra legs it deserves. In a blog on Emojipedia.com, the body said, "we heard you. We made some mistakes. And we are fixing them". The body is also rectifying mistakes in the designs of the DNA and skateboard emojis. This, however, isn't the first time an organisation was dragged into a controversy over emojis. In October, Google CEO Sundar Pichai offered to drop all his work to settle a heated Twitter debate over the correct placement of cheese in the burger emoji. Sadly, the Internet couldn't come to a conclusion.